Halloween is such a great time of year for the young and the young at heart. Whether you are donning a homemade costume or have splurged and purchased something fun to wear, there is no denying that kids love nothing better than dressing up and then eagerly running from house to house with chants of “trick or treat” filling the air and Halloween treats filling their bags. 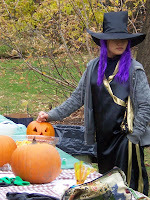 Over the years the allure of Halloween has spread and Halloween events now spans over several weekends. Whether it’s picking the perfect pumpkin or finding a family fun festival, Burlington is the place to have a SPOOKTACULAR Halloween! 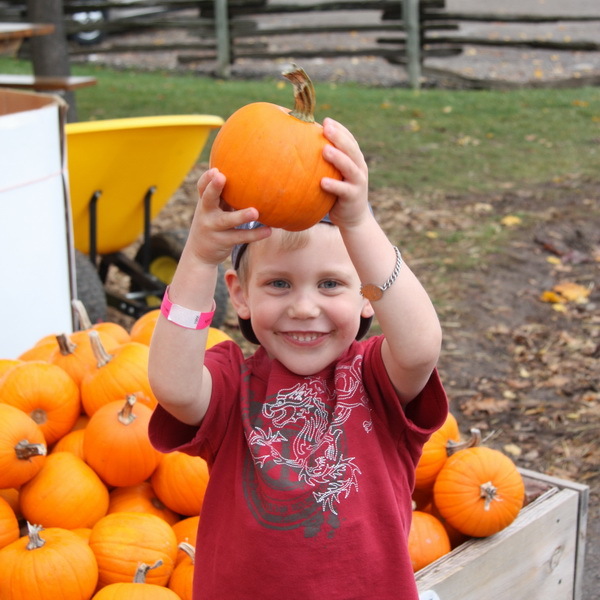 Weekends in October visit Springridge Farm for the Harvest Festival featuring pumpkins, the pumpkin princess and Eggbert. This family friendly event features activities throughout the day including a professional puppet show, wagon rides to the 5-acre corn trail, a Boo barn, pony rides($) and face painting. If your kids (and you) are looking for more fun head to the onsite fun farm yard which includes the new spiderweb climber and farm yard pipe slide. You can visit the animals in the farm barn; hike up the hill to the escarpment educational lookout; play in the giant sandbox; try your hand at milking the plywood cow; work your way through the witch’s mouth corn trail, tricky trails and corn maze and more! After working up an appetite enjoy lunch with their weekend BBQ or stop by their bakery for a sweet treat. Admission is $10.00 per person (ages 2 and up). On Sunday, October 30th at 12:30pm, Springridge is hosting their 2nd annual Halloween Parade! Join in the Halloween spirit - the parade meets at the Little Theatre and follows a professional bagpiper. Wear your spookiest costumes. The parade is included in Harvest Festival admission. And don’t forget to check out Springridge Farm’s amazing bakery, farm market and gift shop before you end your day at the farm. Also weekends in October head to the Royal Botanical Gardens to enjoy the fall colours and Hamilton Pumpkinfest at the Arboretum. 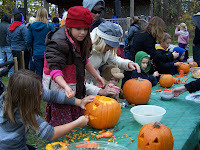 Enjoy the Kids’ Fun Zone, Hay Wagon Rides, Pony Rides, Farmer’s Market, Pumpkin Patch and The Haunted Maze. General Admission is free but there are additional charges for activites. Kids Fun Zone Ride Pass - $25: includes unlimited rides for one day on all Kiddy Rides and Jumping Castles or Pumpkinfest Pass $40: includes unlimited rides for one day on all Kiddy Rides, Jumping Castles, 1 Temporary Tattoo kit, 1 Farmers Pumpkin, 1 Kids Snack Pack (Cookies and Juice box), 1 Sticker Book and 1 Halloween Treat Bag for your treats. Visit the Hamilton Pumpkinfest website for details and pricing. During October, head to Andrews Scenic Acres in Milton and explore their gently haunted forest, straw mountain jump and cornfield walk. There is a $3.00 per person admission charge to the fun farm area. 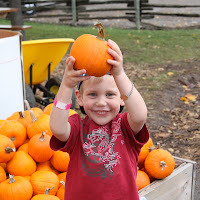 While you are there you can participate in the number one fall attraction, the wagon ride to the pumpkin picking field where everyone can select their favourite pumpkin, whether it is 5 or 80 pounds. Pony rides are also available on Saturdays, Sundays and Holidays throughout the picking season and don’t forget to visit the farm market and (for the adults) the winery during your visit. For those that are into the supernatural, consider Burlington Ghost Walks every weekend up to Halloween. Please call the host hotline at 905-630-7256 for dates and times or visit their website. Happy Hauntings! 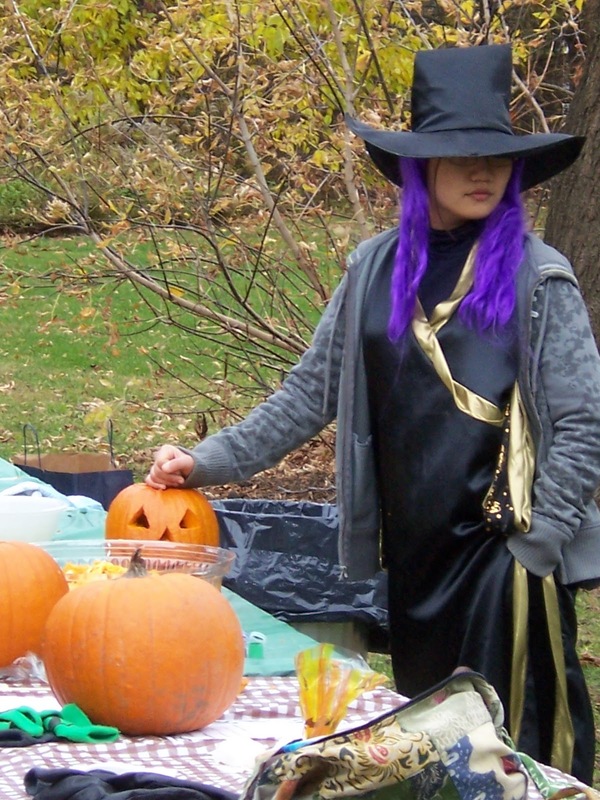 Consider some Halloween camping at Bronte Creek Provincial Park. On October 22nd registered campers can take part in Camper Halloween. Let your creative side show and decorate your site (prizes for the best decorated sites) and then trick-or-treat around the campsites. Finish your evening with a spooky hike where you will learn about owls, coyotes, bats and other creepy critters! 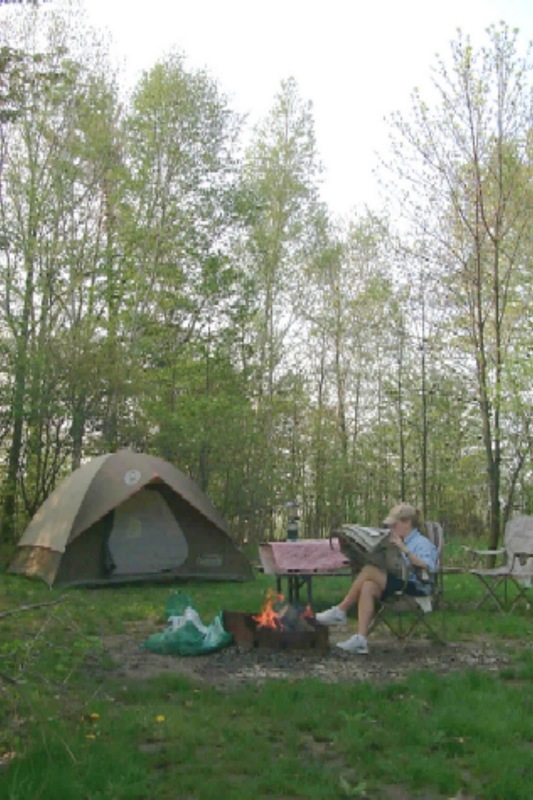 For more information contact the park at 905-827-6911 or reserve your campsite online. Head into Milton to the Streetcar Museum and take part in their Halloween Spooktackular on October 22nd and 29th from 6:30-10:00pm. Walk through the haunted car barn and travel in the old, creaky streetcars along the mainline. If you’re a Halloween fan this is definitely a spooky experience not to be missed! Are you looking for an alternative to hitting the streets for “trick or treating” Mapleview Centre will be presenting its 13th Annual Safe Trick or Treat event. Dress up the children and head to the Mapleview Centre on Thursday Oct. 27th from 5-9pm. Start the night by creating your own personalized animated Halloween flip book from 5-9pm in the food court then the kids can enjoy safe trick or treating from 6-7pm throughout the mall. Be sure to visit the incredible world of bugs, an exhibit of hundreds of insects collected from around the world including the beautiful, rare and deadly giants of the bug world that runs to October 29th. Start your Halloween festivities early at Mountsberg Conservation Area's Halloween Spooktacular on Saturday October 29th from 10am-4pm. This event is free with park admission and features plenty of hauntingly good fun for everyone including a haunted play barn; scary skeleton scavenger hunt; pumpkin bowling; Bird of Prey presentations -owls and vultures Halloween special; bison rides; sssslithering with snakes presentations; a kids "tattoo" parlour and crafts. If you arrive in costume you will receive a free hot drink. For more information call 905-854-2276 or visit their website. Dust off your costumes! October 29th from 7-9pm Mountsberg Conservation Area will present Halloween Spooktacular - After Dark, an evening of goulish family fun (appropriate for ages 8 and up). During this special Halloween event visitors will explore the haunted play barn and then learn some scary park lore on the terrifying trail tour. Dare to get elbow deep in gross out fun at the campfire roast or simply relax with a steaming mug of hot chocolate and some oooey gooey marshmallows. No trip to Mountsberg would be complete without some wildlife lore and visitors will get their fill as they listen for local coyote populations during the Halloween Coyote Howl. Howl your way into the Halloween spirit if you dare! Boo-ware spaces are limited ($16.95/adult or senior, $11.30/children (8-14)) Call 905-854-2276 or purchase tickets online. Celebrate Halloween in Downtown Burlington. On October 29th from 1-5pm enjoy a beautiful fall day and Burlington Downtown Pumpkins & Pancakes in Civic Square at City Hall. Children will enjoy the free face painting, games, balloons and pumpkin crafts before heading off in the costume parade at 3:00pm. Bring a non-perishable donation for the food bank when you pick up your map, then head to participating downtown businesses to trick or treat. If you are looking for an afternoon snack, join The Red Canoe Bistro and The Alex restaurants as they battle it out for pancake supremacy from 2-4pm. Join them as they make pancakes for a cause, $4.00 for a plate and a vote. All funds raised will be going to the Partnership West Family Support Network. Join the gang at Tansley Woods Community Centre for a frightfully ghoulish time. Spooky Splash runs Saturday, October 29th from 1:30 – 4pm and features swimming, games, a haunted house and much more. Admission is only $4.86 +tax per person and tickets are on sale now at the Tansley Woods aquatics desk. Get spooked out this Halloween with The Museums of Burlington’s wonderous Halloween Event on Sunday October 30th from 12-4pm. Enjoy this scary holiday with tours of historic Ireland House showcasing mourning traditions throughout the years. Experience some funeral traditions through the generations of the Irelands. Enjoy the contemporary celebration of Halloween with tons of activities and crafts for kids. Make a magic potion with the witch in her haunted house; put on a brave face and find your way through the haunted woodshed; march in a costume Parade and make some creepy creations with Mad Science. When the ghouls and goblins get hungry, sink your fangs into delicious barbeque and refreshments. Enjoy live entertainment for children and adults including costumed belly-dancing instructions; fun carnival style games and attractions; vendors and more. Only $5.00 for children and $2.00 for adults. Every Family receives a complimentary pumpkin (While supplies last) and goody bags for the children. Don’t miss out on all the fun this Halloween! Call 905-332-9888 or visit online for more information. Racing witches, ghosts and goblins – oh my! Spooks n' Spokes Mountain Bike Race at Hilton Falls Conservation Area is sure to be a great participant or spectator event. Join racers on Sunday October 30th from 8am-1pm as they take on the trails in costume. Racers should register early for this popular time trial that is suited for all ages and abilities. This Halloween race has categories for those 10 & under, those with special needs, teens, and adults in addition to your choice of a long or short course. Enjoy the fall colours, a barbecue lunch, great prizes including best costume and lots of fun. Call 905-854-0262 or visit online for all the spooky details! For a truly unique and memorable Halloween night this year, Seneca Avenue is the place to be! Located between Guelph Line and Brant Street and running from Lakeshore Road to New Street, this neighbourhood has been a Halloween attraction for the past 30 years. The City of Burlington even closed the street to traffic last year, making it into a wonderfully festive, spooky street party. Gene a resident of Seneca Avenue, has fully embraced the tradition since moving there four years ago. Last year, his house transformed into a giant pyramid, with his driveway becoming the Nile! While the night is all about having fun, entertaining the crowds of children and families that inundate the street, and, of course, giving out plenty of candy to the trick-or-treaters, Gene also accepted donations for Unicef and collected over $200 last year. This year, Gene is planning on a space theme for his house, complete with a lunar landing and another water feature. He will also again be accepting donations for Unicef. The displays are usually set up throughout the day on the 31st and are dismantled early the next day. You can take a drive along the street during the day to check out how the decorations come together and then come back in the evening for an exciting stroll through the completed, spectacular sights of Seneca Avenue! Happy Halloween from Tourism Burlington!